If you think of Osaka, food like okonomiyaki and takoyaki come to mind, not necessarily sushi. But today we will introduce you to a place in Osaka where you can enjoy deliciously Edo-style sushi for a reasonable price in a relaxing atmosphere. Sushi might not be the first food that comes to mind when thinking of Osaka. With famous local treats like okonomiyaki and takoyaki, it is easily forgotten that Osaka has its own port and offers excellent fresh fish as well. In this article, we will introduce you to Sushi Chiharu, a relaxing shop in Osaka where you can enjoy exceptionally fresh sushi prepared right in front of you. Founded in December 2014, Sushi Chiharu is a fairly new sushi restaurant located in the Fukushima ward of Osaka. Their goal for their customers is to experience fresh, traditional Edomae Sushi at an affordable price. Rather than highlighting the deliciousness of the raw fish, the "flavorful" feature of sushi is more important to Chiharu. That is why they prepare the ingredients by boiling, salting and marinating them. The preparation of the sushi is very important if it comes to Edomae sushi. Sushi Chiharu also works closely with a professional cooking school and some of the school's graduates come to work as the store's sushi chefs. This way the graduates can practice their newly learned craft as soon as they leave school. You can choose from three different courses for every budget. Their lunch option will cost you 2800 yen and includes nine pieces of sushi and miso soup. Their evening course costs 3500 yen and offers you three types of appetizers, two types of sashimi, nine pieces of sushi and a cup of green tea. If you would like to enjoy more privacy and a more sophisticated atmosphere, you can also choose the 2nd-floor evening course for 7000 yen. Sushi is a common term for raw fish served with vinegared rice but there are many kinds of sushi. Edomae sushi was initially created about 150 years ago when Tokyo was known as Edo. Edomae can also be translated as Edo style. So it literally means Edo style sushi. The lifestyle of the Edo period was fast and people didn't have much time, so fast food became popular during this period. People tried to invent ways to keep raw fish fresh for as long as possible to sell it at fast food sushi stands. Of course, refrigerators weren't available at that time and ice was expensive so they had to find other options. To be able to keep the freshness of the ingredients for a longer time, they started to simmer the main sushi ingredients such as sea eel, shrimp, and shellfish in broth and even grilling some of them on a charcoal grill. For ingredients like tuna, bonito, and halibut, the raw taste is vital, so they soaked these ingredients in soy sauce. The sodium in the soy sauce prevents the fish from spoiling too quickly. Other fish such as gizzard shad and mackerel have a strong flavor and could be prepared just with salt and vinegar. The preparation essentially depends on the kind of fish used. After this process, the fish is arranged on top of vinegared rice balls. The antibacterial properties of the vinegar help to further prevent the fish from spoiling too quickly while enhancing the flavor of the fish. Today we will introduce the lunch course at Sushi Chiharu which is their most affordable option. It includes nine different types of sushi, miso soup and a cup of green tea, being priced at 2800 yen. Before the chef starts to make the sushi, he will ask if you have any allergies or dislikes. If you do, you should speak up at this point because you can't choose your sushi in this set meal after this. The chef will prepare a carefully selected sushi line-up depending on the season and availability. The fish used is freshly selected from the nearby fish market in the morning of the same day. If you make a reservation beforehand, you will get a complimentary appetizer. In our case, it was chawan-mushi (savory Japanese steamed egg custard cream) but the type of the appertizer depends on the season. Next, you will receive a beautiful glass plate with a small portion of pink ginger on it. The chef will prepare one sushi at the time and serve it to everyone right after it is done. Don't worry about not knowing what you just received - he will tell you what he put on your plate. Most of Chiharu's staff speak English and some even German. Even though the chef will prepare the types of sushi one by one, some might take longer than others. For example, in our case, he arranged some salt water eel on bamboo leaves on the grill before he started preparing another sushi. Nothing is rushed at Chiharu. Every step is thought out and carefully executed. Most people will eat their sushi as soon as they receive it but you can also choose to watch your plate slowly filling up. Please be aware that this is not the recommended way. You should enjoy your sushi as fresh as possible. Here you see the full sushi line-up of this day including nine types of sushi, kera-yaki (an Edomae style omelet), miso soup and a cup of green tea. Even though this sushi wasn't eaten right after it was served, it was still incredibly fresh and flavorful. The lunch course will take about one hour from start to finish. This sounds like a long time but it really doesn't feel like it. You will leave Chiharu feeling completely relaxed by its atmosphere and the delicious fresh sushi you just tasted. You might be wondering why you should spend so much money on a couple of sushi pieces if you can get three or four times the amount at any conveyor belt sushi for the same price. The answer is that the experiences are completely different. Conveyor belt sushi is a really great and delicious fast food option but it can't provide you with the same carefully prepared, flavorful sushi you can get in a shop such as Sushi Chiharu. Another unique point is that a shop that focuses only on traditional Edo style sushi is very rare even in Japan. If you want to enjoy a traditional Edo style sushi experience, you should definitely give Sushi Chiharu a try. Price Lunch course 2,800 yen/3,000 yen ~ 3,999 yen. Dinner course - 1st Floor 3,500 yen/ 4,000 yen ~ 6,999 yen, 2nd Floor 7,000 yen/8,000 yen ~ 9,999 yen. In cooperation with Sushi Chiharu. Craving For Soft Rice Cakes? 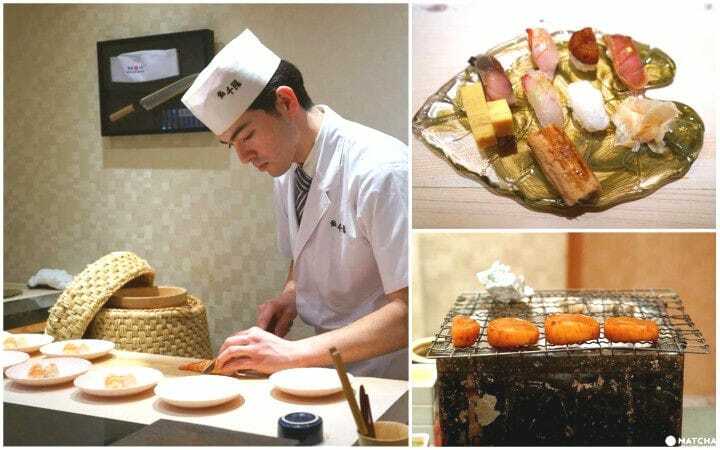 Try The Freshest Mochi At Iseya Oyama!